The film starts out with an execution. We have no idea why this woman is being executed, but she is. After the scene ends we are taken to an old library run by Vincent Price. A reporter who was at the execution wants to know more about what made the woman commit the crimes that got her executed. Price doesn’t want to but does anyway. The first story he tells is about an elderly man who is nerdy and weird. He is forced, by circumstances and life, to care for his needy sister. Wanting to be a part of something, he asks a female coworker out on a date. At first the woman refuses, but does so because he just wants to take her to dinner. After dinner she blocks his advances and he kills her. Now that he has already killed once, he drowns his sister in the bathtub. This story is pretty decent. The lead performance by Clu Gulager, who is under a lot of make-up, and he is the highlight of the story. The ending is really bleak and creepy as hell. The second story is about a man who is on the run from gangsters. He is shot in the back and left for dead. He wakes up in the shack of an old man, who practices voodoo and has been around to see many historical events happen. I liked this story better than the first one. It is a simpler story of revenge and greed. There is some really good make-up effects towards the end. I kind of knew where the story was heading, but I did not foresee the outcome. The third story is about a woman who falls in love with a carny who can eat glass. She wants him to run away with him, but the snake woman holds the glass eater as well as the rest of the carnies under her spell. This story was also a really good one. The performance by Rosiland Cash, as the Snake Woman, is a perfect horror performance. She adds a really creepy vibe to an already creepy story. The effects in this story are also first rate. This is the goriest story of the bunch. The last story, which is the weirdest but also the weakest, takes place after the Civil War has ended. Four soldiers are taken captive by a group of kids. The kids answer to someone known as “The Magistrate”. What happens next is shocking and off-putting. I did not like this story as well as the previous two. It was not the things that the kids do, but that the story seemed like it was going nowhere. I also could not get over the performances by the child actors. This is some of the worst acting I have seen in a horror film. The film was directed by Jeff Burr, who would go on to be the go to guy for horror sequels in the 90’s. He is the guy who brought us a proper sequel in Texas Chain Saw Massacre III. He also gave us The Stepfather II and Pumpkinhead II. All of these are really good sequels and Burr is a talented director. His direction and subject matter reminds me off Brian Yuzna, the other go to guy for horror sequels in the 90’s. Burr tells each story in a different way, but this doesn’t always lead to clarity. The first and fourth stories suffer from Burr wanting the audience to figure out what is going on before he tells them. For the first ten minutes of the first story I could not tell what was going on. I knew who the characters were, but the way the story unfolds is kind of muddy. The fourth story, the one with the kids, relies on shock value more than telling a story. The story told is very similar to Children of the Corn and I think that Burr expects the audience to figure out that he is taking elements from that story. While I didn’t care for that film either, I think that Burr would have been better off letting the audience in a little bit more. By the time the big reveal comes I just didn’t care. The two middle stories are fantastic though. Both stories revolve around voodoo. The first of the two deals with a fountain of youth. The lead of the story, played by Terry Kiser, finds out that the man who saved him has been living since before the Civil War and he wants in. The second of the two deals with a woman who does not want to let anyone go. She has them controlled by voodoo dolls and will do anything to keep them. The wrap around story, with Vincent Price, is cool, but unnecessary. It always nice to Price in a film, but, like most wrap arounds, this one ends the same way. The only real connection to the stories is the town. 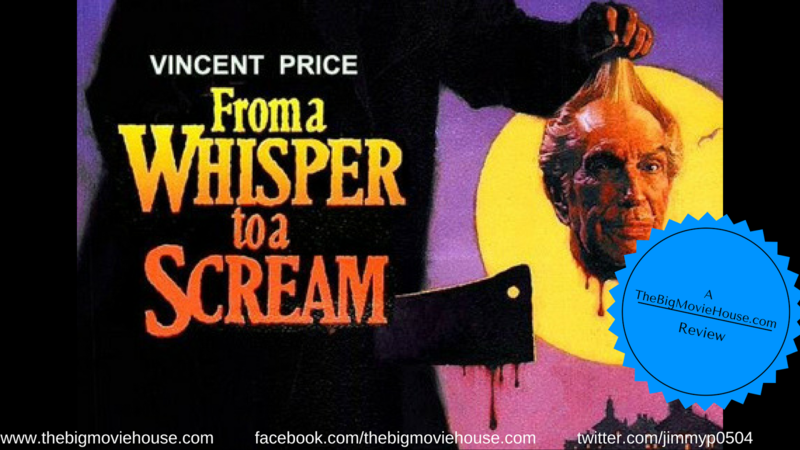 I liked most of From A Whisper To A Scream . It has a go for broke attitude about it and pulls no punches. The direction is pretty good as are the effects. The first and last stories could use another work through, but they aren’t lost causes like many anthology stories. Some of the imagery will stick with you and that isn’t a bad thing. Burr was getting his hold as a director and fared a lot better with his next film, The Stepfather II.